The Wizard of Oz is a colourful fantasy musical. It provides family entertainment containing many familiar songs like “Somewhere over the Rainbow” and “Follow the yellow brick road”. Dorothy finds herself over the rainbow in Munchkin land following a cyclone. Her house has squashed the Witch of the East, leaving her loved and admired by the Munchkins but hated by the Wicked Witch of the West, the sister of the Witch of the East. Whilst following the yellow brick road she makes acquaintance with a brainless scarecrow, a heartless tin man and a cowardly lion. The four journey on together to meet the Wizard but he isn’t everything that they expect! A timeless classic with a moral twist. Dorothy lives on a farm in Kansas until a cyclone arrives, and picks her, her house, and her dog up and deposits them in the land of Oz. Things in Oz are strange and beautiful, but Dorothy just wants to get back home. She begins to travel to the Emerald City where a great wizard lives and on her way she meets a Scarecrow who needs a brain, a Tin Man who wants a heart, and a Cowardly Lion who desperately needs courage. They all hope the Wizard of Oz will help them. Dorothy is helped by the Good Witch of the North, but she's also sought by the Wicked Witch of the West, who seeks revenge for the death of her sister; the Wicked Witch of the East, for which she blames Dorothy. After many twists and turns, Dorothy returns to Kansas knowing now that “there’s no place like home”. Wow, what lovely comments we have had from the opening night of our production of The Wizard of Oz, thank you everybody! If you're looking forward to seeing the show this week, here some pictures of rehearsals to keep you going until then. So who's excited...the opening night of TMTG's "The Wizard of Oz" is tonight! What's more, tonight's performance is officially SOLD OUT! Look at this amazing time lapse video of our set up for The Wizard of Oz, taken over the last few days by Oli (who's also our lighting extraordinaire!) at the Armstrong Hall. If you pay attention you can even get a sneak peak of our first dress rehearsal which was last night! *ALERT* Show week has arrived and we have now sold over 90% of tickets for The Wizard of Oz! If you want to see the show, we advise you book soon so you don't miss out. Best availability is currently on Thursday night. Wizard of Oz - Competition - Can you find them all? Are you able to find Dorothy, the Scarecrow, the Tinman and the Lion around Thornbury? For your chance to win 2 free tickets to see our 2016 production of The Wizard of Oz as well as to have your photo with Dorothy and trio, have a go at our competition. Read more about Wizard of Oz - Competition - Can you find them all? Just ONE WEEK to go until Wizard of Oz opening night, we're so excited! Not content with her starring role as Toto, Maisie the dog has decided that while she is with TMTG she'd like to try her paw at directing too. It's true, there are just a few tickets left for our afternoon performance of the Wizard of Oz on Saturday 29th October, so if you were planning on coming to see us that day then you better be quick! Read more about Matinee Almost SOLD OUT!! 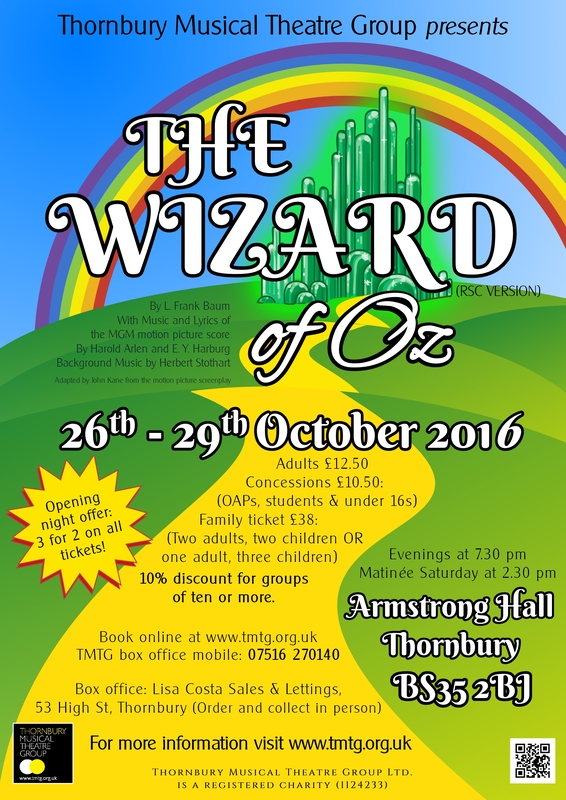 TMTG are so excited to be performing the classic show "The Wizard of Oz" at the Armstrong Hall in Thornbury from 26th-29th October, 7:30pm nightly with matinees at 2:30pm on the Friday & Saturday. If you can't wait that long to see it, here are some pictures from our recent photoshoot to keep you going until then! Meet our two Wizard of Oz witches, Steph Griffiths as 'Glinda, the Good Witch of the North' and Jo Hachani as the 'Wicked Witch of the West'. As Dorothy travels to Oz, will good win over evil? A few pictures from tonight's rehearsal for "The Wizard of Oz", it's exciting seeing the show take shape! Shhh, nobody tell Maisie who's playing Toto in our production of The Wizard of Oz about this, she might start getting ideas! Read more about Toto News! Say hello to Nadia who will be playing Dorothy in our upcoming production of "The Wizard of Oz", along with Maise who will be playing her trusty dog Toto. It's the first time either have performed with the group and we're really looking forward to seeing them up on stage! Think we surprised a few people in Thornbury this morning whilst doing our Wizard of Oz photoshoot. Funnily enough, everyone passing by seemed to know what show we were doing! More pictures coming soon. We've been taking advantage of the good weather to do some Wizard of Oz sign painting outside. You'll be able to spot these around Thornbury later in the year! Maisie the dog was extremely happy to attend her first rehearsal for The Wizard of Oz tonight. Well done all for another amazing show from the acting and staging to the props and make-up. The orchestra were wonderful and there was some great singing, I am looking forward to the next show! Well done you guys. Another show well done Awesome performance from every single one of you! I have just returned home after watching an absolutely amazing first night performance of The Wizard of Oz at The Armstrong Hall. I thought that I had been privileged to see Andrew Lloyd Webber's production in London on its opening night several years ago after the TV search for Dorothy but I can say, hand on heart, that the TMTG production this evening was far superior in every aspect.